But, if I’m not going to have lunch, a big breakfast is in order. Here’s one of my huevos rancheros variations. This morning, to serve just myself, I fried 3 sliced multi-colored small potatoes in canola oil, seasoned with salt & pepper and minced garlic at the end, so as not to burn the garlic. Making potato chips in a pan is a bit tedious, but a texture somewhat crisp is achievable; use a big pan on medium to medium-high heat, and arrange the potato slices so that they don’t overlap much, and flip them periodically. A very thin, metal spatula works well. A mild, mexican (uncooked) chorizo. Meanwhile, I fried 3-4 oz. mild mexican chorizo, crumbling it as it browned. While both the chips and chorizo drained on paper towel to soak excess oil, I scrambled 2 eggs in the chorizo pan, and stirred in a bit of sour cream and chives when the eggs were done. Adding a cream or sauce to scrambled egg, just when done, lowers its temperature immediately to help prevent overcooking. I served it topped with hot sauce and chopped chive. YUUUUUM. I must eat this now! Thanks, Pami! I’d set you up if I could. :D I’ll make it for myself this weekend maybe. I’m definitely the ‘eat as much for breakfast as possible’ type of person. So, this would be amazing. 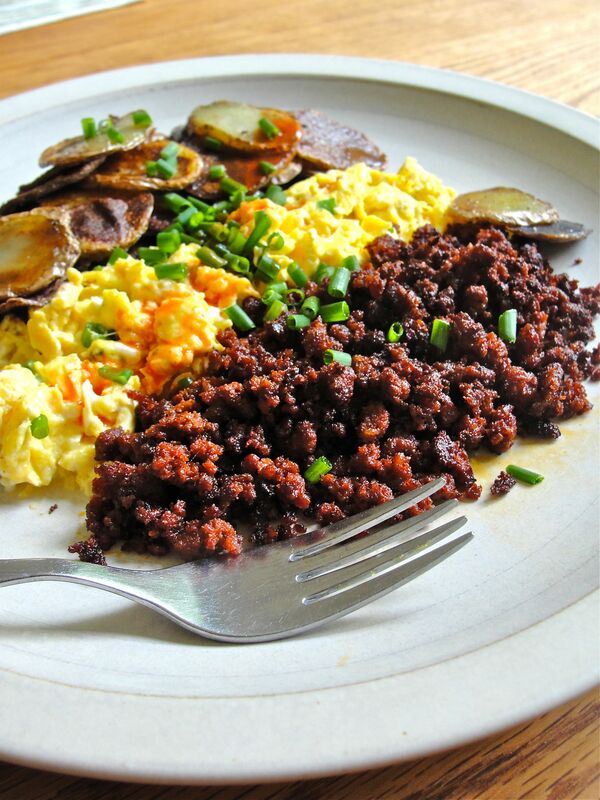 I make plenty breakfast each morning, eggs, ham, fruit, coffee and milk, cereals … and this is a good idea of ​​breakfast…I will try it..
Won’t you going to have a hard time finding Mexican-style chorizo in Italy? I bet you’ll have Spanish chorizo, but it’s completely different. I haven’t spent any time in Italy, but it was so difficult finding Mexican ingredients in France. 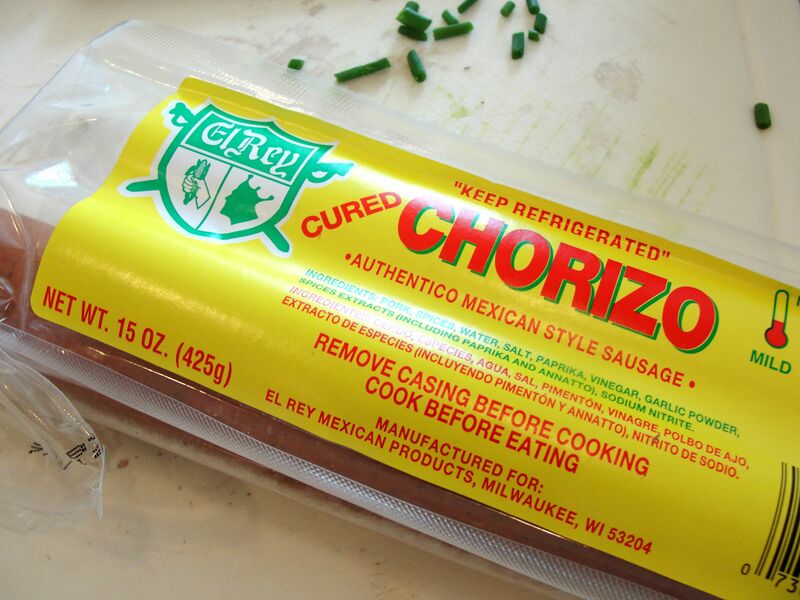 Oh, I meant to say the Mexican type is not dried like the Spanish chorizo, it’s moist instead. Have you had that? You really have a knack for food styling…. This looks amazing! I’ll have to try it sometime. 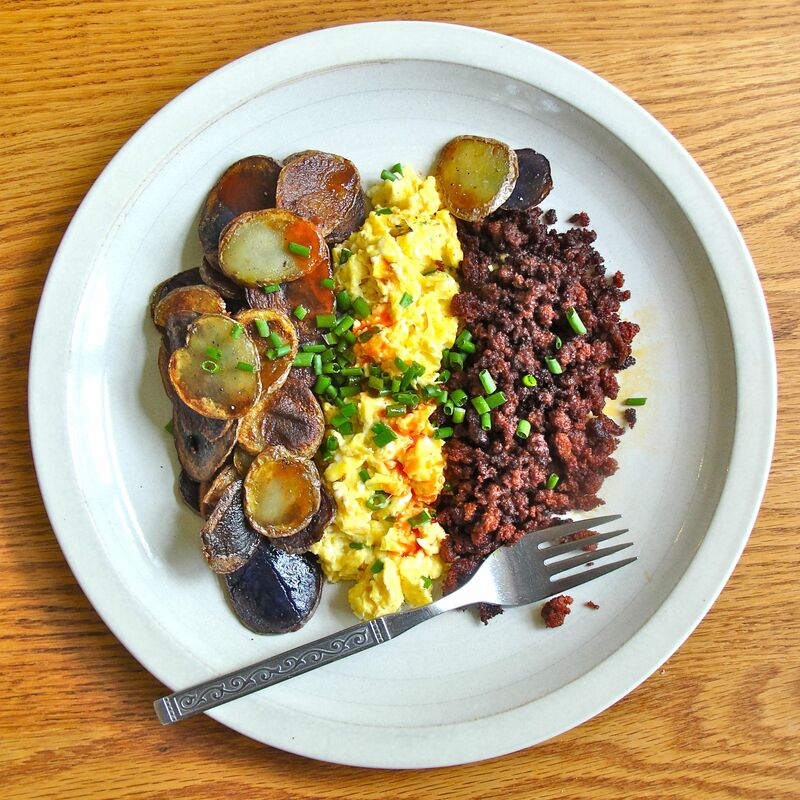 I like the idea of having the chorizo separate from the eggs so you can combine just the right amount for each bite. :-). Beautiful photos! Thanks, Annie! Ha, that’s exactly right! It’s best to mix it together just as you like while you eat it. That’s the way my favorite mexican kitchen does it. I love your interpretation of this classic! This looks fantastic! 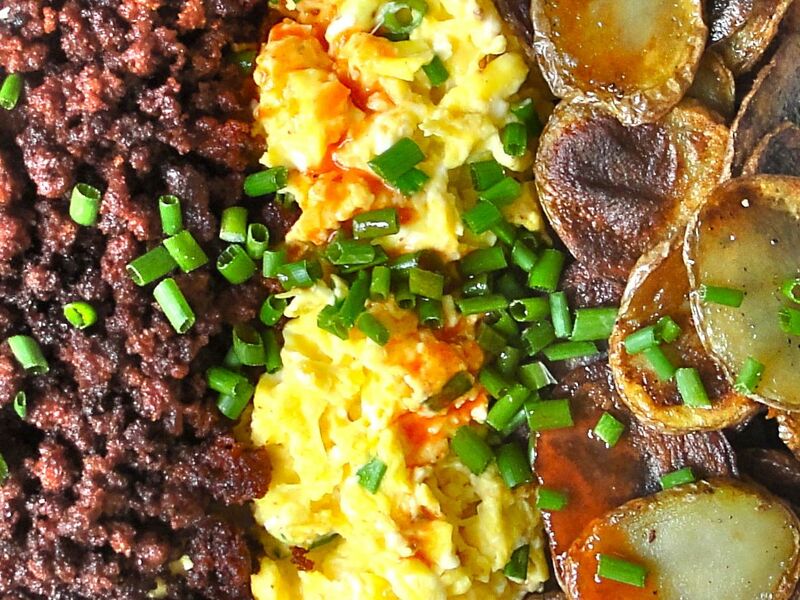 :) I will have to try this next time I’m hosting a brunch. I liked the color from the violet potatoes… I used those in my last masala, but the color was lost there. That sounds great! I love how different Mexican chorizo is from Spanish :) The taste, texture, everything is so different – but so yummy! If you do that with the chicken – I hope you post it!